Historically, humans have enjoyed sending things via balloon, including Legos, cameras, farm animals, and the teachings of Jesus Christ. Alright, well: that’s freaking cool. In today’s post, I’d like to explore the problem that Project Loon is looking to solve: this idea that the Internet isn’t a complete global community. Those who have access to the internet — and know how to use it — have a huge advantage over those who don’t. The gap in access between the know-hows and the know-nots is stark. We see evidence of a gap in access between the educated and the uneducated; between whites and minorities; urban and rural areas; the rich and the poor; the young and the old; the abled and the disabled. This is called the digital divide. I hinted at this a bit in my post on Wednesday. Access to the internet means access to a massive wealth of information, including free online education initiatives like Coursera, academic databases, digital archives, reference sites, and the news. Internet access encourages economic growth and social connection. It makes it easier to sign up for certain services, like social welfare. It makes it possible for activists (think Arab Spring) to democratically organize. Some countries have even declared that internet access is a fundamental right. Digital inequality is often linked to race and income. Adoption rates of broadband internet for blacks, Hispanics, and low-income households is significantly lower than the national average. Food for thought: According to a study released by the Pew Internet and American Life Project just last year, 20% of American adults do not use the internet at all. That’s one out of every five people. 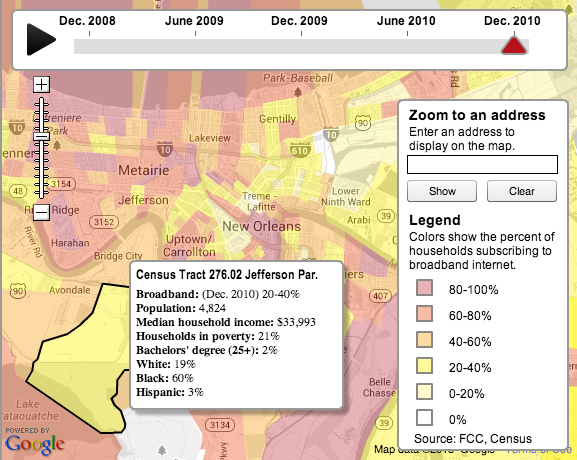 We can also see the digital divide on a much larger scale. This map, created by a Facebook intern, shows friendships across the world. I’d caution viewers to remember that this map is imperfect, partly due to a geographic preference for social media sites. Facebook is blocked in China, so people there use RenRen. Russians can be found on a European network named VK. Still, check out those huge swaths of darkness in central Africa and South America. This map shows us the perspectives that we might be missing when we think we’re linked into a global community. Leetaru, K., et al. First Monday, May 2013. Language also poses an interesting problem for internet users. This map, from a paper recently released in First Monday, shows tweets from November 2012 color-coded by language. English dominates, giving a strong preference to English-speaking internet users, and making efforts to translate the Internet that much more important. 10% of the world speaks English, but 80% of the web is written in it. *Update 7/23/13: This number may be incorrect. See my post here on language use and the web. The entire paper is filled with great maps of digital use. I encourage you to click through for the rest. Aviva Hope Rutkin is a science and technology reporter in the Boston area. She currently writes for the MIT Technology Review. Follow her @realavivahr. How worried should you be about New Mexico’s bubonic plague? The Confederate Army experimented with surveillance balloons, which the Union soldiers subsequently took pot shots at.